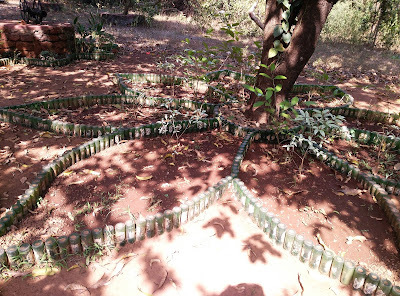 THE WRITING BUDDHA - Opinions | Books | Movies: A 5-Days Trip to Goa with Family!!! I had visited Goa for the first time with two childhood friends in December-2012 and since then I wanted to go with my parents as they had always dreamed of a trip to Goa. Finally, their 2 decades old dream of a family trip to Goa got accomplished successfully last month when my father returned after an year from KSA. My parents wanted 1 or 2 families more to join us but I always wanted only three of us to travel whenever we do. And as I was planning everything in absence of my father, I did what I wanted to do. Haha! With your family, you can chose whichever hotel, restaurant and mode of transport but with external members along with you on a trip, you have to take care of their choices too and that's where you end up compromising almost in every section. 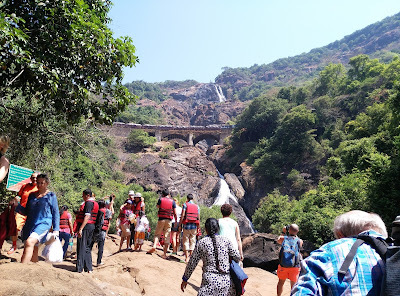 Because I feel that this trip has been quite wonderful as we covered most of the important locations, I want to let my readers know how we planned it so that it would be helpful for everyone while referring others' experiences. We caught Rajdhani Express from Panvel station on 20th March at 4.30 AM in the morning. We reached Thivim station around 1 PM on the same day. We had our booking up to Madgaon but because I had booked the hotel near Calungate beach, we had to halt at Thivim as per the advise of many travelers. From there, we took an auto for Rs. 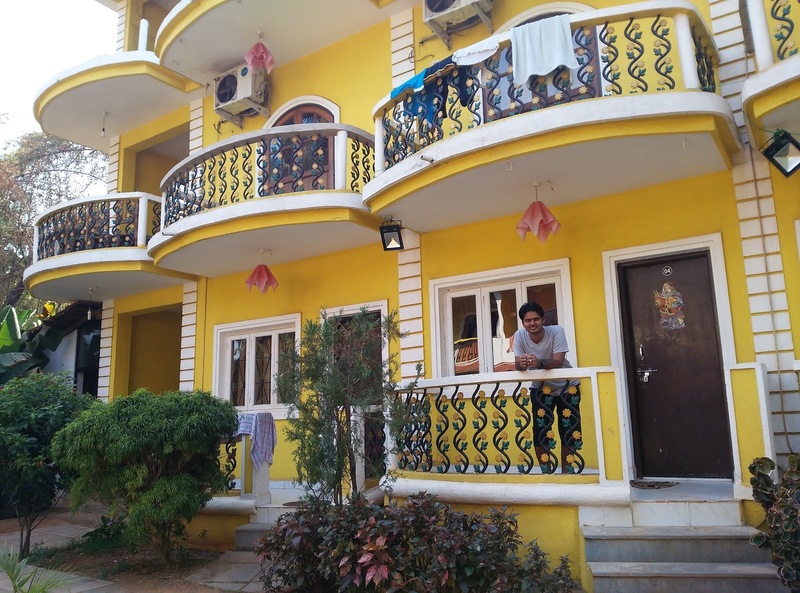 400 and reached our hotel, Dreams Palm Beach Resort, which was situated at Umtta Vaddo, just 100 meters from Calungate Beach. The hotel package included A/c room, a television set with cable, double bed and an extra mattress for me (Hahaha! ), morning breakfast and room cleaning service. I booked for 5 days on Cleartrip. The main person out there named Prashant is very co-operative. He helped us in planning on what to visit on which days. But unfortunately, this can't be said for his staff. Specially, a boy named Sharath who got drunk in night and started abusing us and every families passing by. Well, on the day we reached, we had a good lunch at Sagar Restaurant nearby which is Pure Veg. and slept whole afternoon. In the evening, we just had a walk at Calungate Beach and the market area. We had our dinner at Capricorn restaurant. 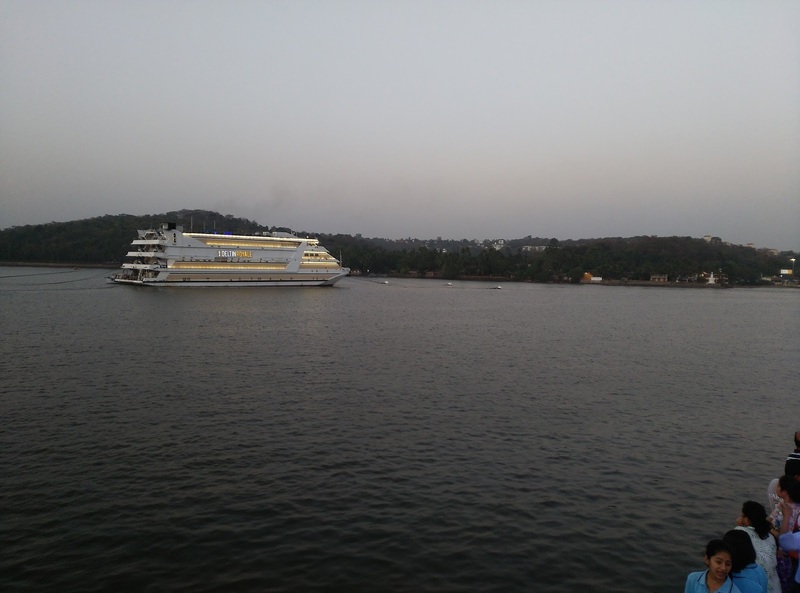 For the next day, on 21st March, we took the package for South Goa from Fernandes Tours and Travels which costed Rs. 350 per head. We visited Miramar Beach, Dolphin ride(which costed Rs. 300 per head extra), Basilica of Bom Jesus (Church) and Old Goa Church, Mangueshi temple, Shanta Durga temple, Dona Paula and a wax museum. 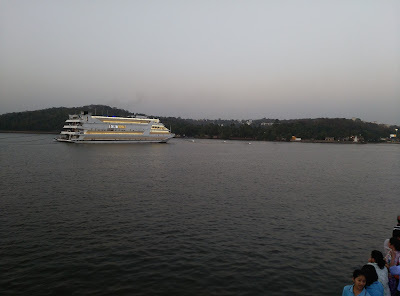 In the end, we were taken for cruise at Panjim which again costed us Rs. 300 per head, which wasn't included in the package. It was a very pleasant experience. With people dancing on stage and sunset happening and many other cruises crossing yours, you will not want this one hour trip to end. This whole package cost us Rs. 50 per head extra because we went through Mr. Prashant of the hotel. Hence, for the next day, we booked it directly from the same Tours and Travels. On 22nd March, we covered North Goa. It was priced at Rs. 300 per head. We covered Aguada Fort in the morning. 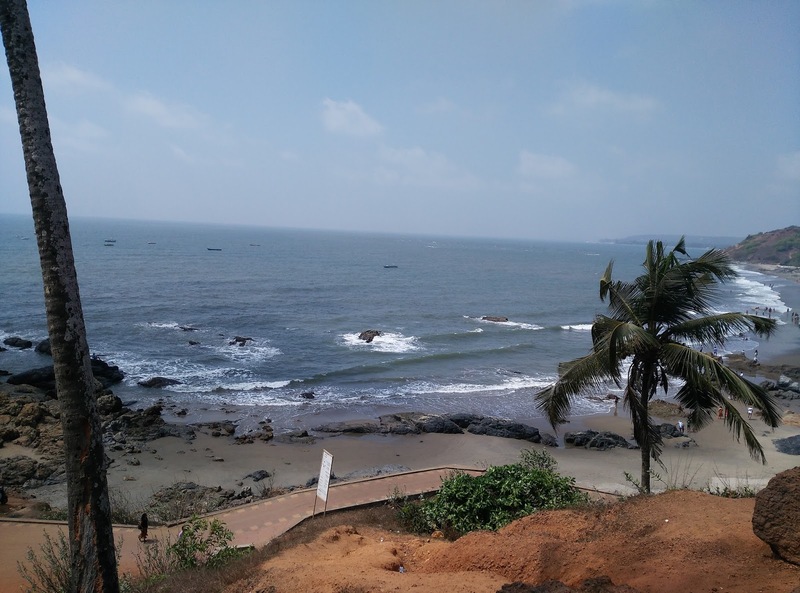 It definitely has wonderful view of the sea but any person with knee problem will find it hard to enjoy it. As my father is having knee problem, he found it little hard to walk on the rocks. Then we were taken to Ashwem and Palolem Beach which is almost at the Goa border. I found both these beaches the cleanest with blue water. At every beach, we were given limited time of 45 minutes hence we couldn't enjoy swimming but it was still a great experience as there aren't much crowd here unlike Calungate. 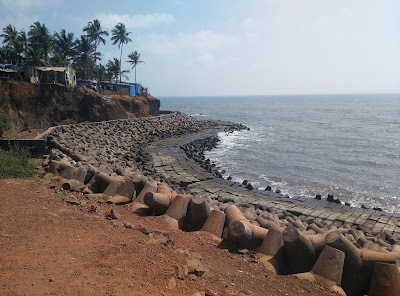 After this, we were taken to Anjuna beach and Chapora Fort. Anjuna is good for taking photographs because of red rocks at the shore. In the end, we were taken to Wagator Beach which is again another great beach. In the end, through Baga beach, we were finally left at Calungate around 4.30 PM from where we started our journey. We had planned for Casino in the evening but because my parents were tired enough, we just went out for dinner. 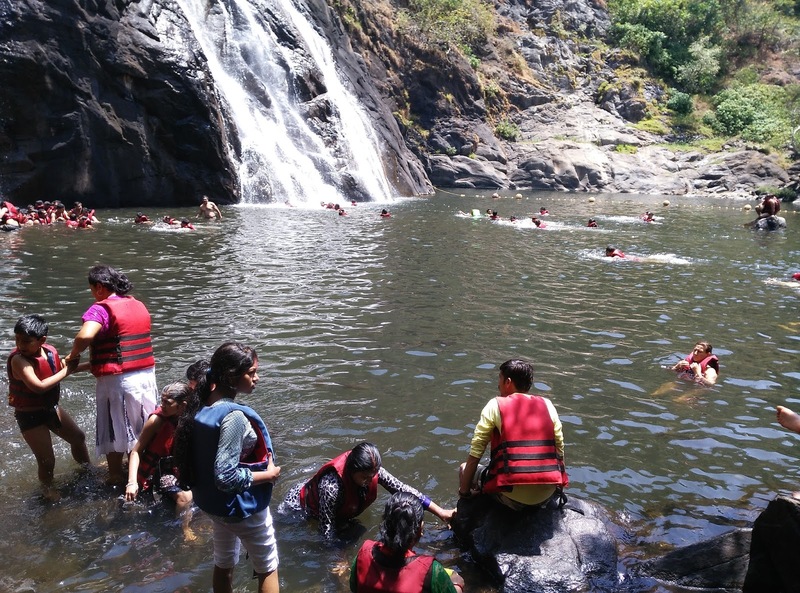 On 23rd, we took the package for Dudhsagar Waterfall and Spice Plantation for Rs.1500 per head. In the morning, we had to catch bus at 6.15 AM. It was surprising as a mini-bus having the capacity of 16 passengers arrived instead of the big one. But we got to know later that big buses are not allowed at Waterfall. 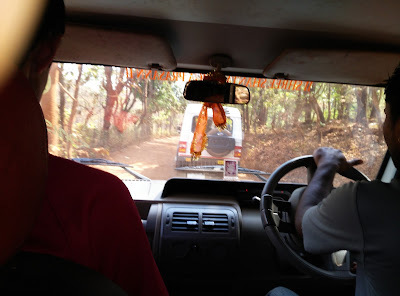 After almost 2.5 hours, we reached the entrance of the Dudhsagar waterfall after which we were shifted to a jeep. 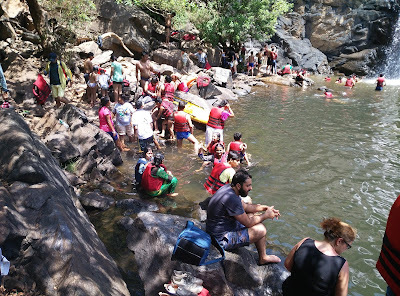 We were given life-jackets as it is compulsory before entering the waterfall. The jeep drove us through rocks, water and wonderful greenery. It took other 30 minutes and we reached the waterfall. We were given 2 hours there. The waterfall and the small lake which was meant for the tourists to enjoy swimming was great. The view of train passing in between of the waterfall is the best view that you can ever get. Hats off to Indian railways for making that possible. After that we were taken to The Spice Plantation. As soon as we entered, we were provided lunch. Lunch was included in the package. Lunch wasn't great and it was hard to find taste in any of the dishes provided. After that we were taken for the round of the spice plantation and the guide gave us information regarding how each of those plantation is organically produced and maintained. The organically produced products were available there and many tourists found it enough attractive to purchase them in bulk. With this, our day ended. I forgot to mention but both the churches in South Goa was also included in this package which was covered in morning itself. Finally, on the last day i.e. 24th March, we had to catch our train at 6.45 PM from Thivim station. Hence, we had kept last day reserved for swimming and bathing at Calungate beach. Haha! As it was Holi, the environment at Calungate beach was quite celebratory and we enjoyed the whole day there. I had booked an extra day at hotel just for enjoying as much as possible because we had no plans for beaches in first three days. Due to which I paid a whole day charge for just 4-5 extra hours in the hotel. With this, our trip ended successfully with overall per head cost somewhere between 9000-10000. We mostly tried sea-foods in Goan cuisine. And as a suggestion, I would like to tell all of you to keep your bags light when traveling to Goa. Purchase top and shorts from Goa market itself as they are cheap and best for 2-3 days trip. 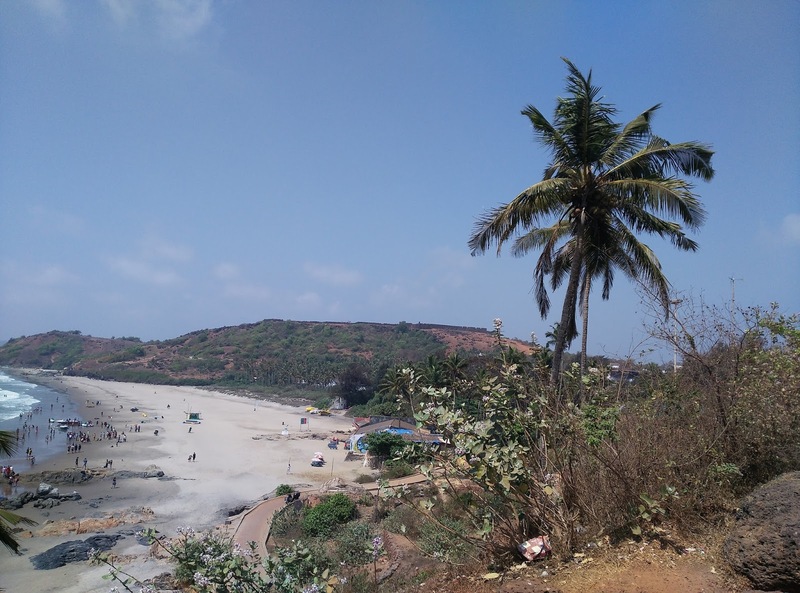 Goa is very hot for most of the months hence you'll not find yourself wearing any of the dresses that you would be carrying with yourself. That's all.